Artists abound in hidden studio hideaways in upcountry Maui. This particular studio, Maui Monkey Business, was located towards the Makawao end of Haiku. flanked by plumeria trees and heliconia. I loved this screen print on paper... It was on the wall of the studio. Not sure if it's persimmons or oranges. Beautifully hand dyed and screen printed trivets and runners. These are designs by Maui Monkey Business. Supplies: silk screens. Just the tip of the iceberg. Around the corner is another small room with shelves of hand dyed fabrics. Inside the quonset hut studio space. Artist Linda bent over her textiles. from the WWII military presence on Maui. Linda hand dyes each piece of fabric and then prints her patterns. What a great space to create in! A picture post for today... holiday foliage and landscaping around Maui. Protea garland from the Waldorf School Holiday Faire. Protea are the flowers in the middle that look like feather dusters. Another holiday garland from the Waldorf School Holiday Faire: Christmas berry are well-named because they are red and produce fruits around Christmas. They are NOT edible. Poinsettia at the Queen Ka'ahumanu Shopping Center. Not sure what the white and green striped plant is. It's beautiful though, and popular here. Just for fun: a Christmas serrano pepper in my garden. I have never seen a pepper do this, half red and half green. It really looked like this - I didn't photoshop the pepper. Holiday poinsettia bushes growing outside in Haiku. The classic red poinsettia and the less familiar white poinsettia with small flowers and leaves. Very poisonous. Growing next to Hawaiian ti leaf plants. The yard with the red and white poinsettia bushes. Very patriotic with a flag. And it's tropical too, with the pink hibiscus plant up front. Another shot from the Hali'imaile Community Garden. These are ginger flowers and buds. Actually, I don't see any flowers, just the buds, but they look pretty cool. This is the same edible ginger used in food. HO HO HO! Santa Claus lands the big one! to pull over at the time. This display is right on Makawao Avenue on the makai side (oceanside). Makawao is also having a Chistmas town fair today, so stop by if you have a chance. SANTA WILL BE AT THE LIBRARY FROM 10:00 A.M. TO 3:00 P.M.
PONY RIDES FROM 11:00 A.M. TO 2:00 P.M. Updated 1/8/13: Just finished the first rough transcript. Scroll to the bottom. This post is going to be rewritten and edited, but in the meantime, here goes. Originally, I thought I would have been able to post the three transcripts of three video clips, but it has taken longer than I expected. Here are three videos taken at the December 3rd, 2012 Upcountry Sustainability meeting in Pa'ia, Maui featuring Lucienne de Naie and Mahina Martin's presentation on the Public Lands Development Corporation, Act 55. This is a big threat to public lands on islands, including prime farm lands on Oahu, watershed land, and pristine land like the Ahihi-Kinau natural area on Maui. There is one more video I hope to add later. Lucienne: We have these little hand outs the cliff notes version of what you can do, who you can write… where you can go. Mahina: Lucienne will also talk a little about the Sierra Club. Lucienne: the end of the 6 week period is the start of the legislative session… Once it starts, things happen very quickly. Mahina as you can tell. Lucienne: Thank you to Upcountry Sustainability. I think Mahina and I are very grateful for this. We kind of rubbed elbows at the same meeting in august, and thought somebody should start getting the troops educated here and getting the word out. My name’s Lucienne de Naie. I’m an activist with a couple of different organizations but I’ve served as an officer chair and another officer statewide of the Sierra club. The sierra club is one of the few organizations in Hawaii that actually has a fulltime person tracking what the legislature is doing. And he’s very busy, he’s our director, Robert Harris, and he’s an attorney, so he’s a very smart guy, and I remember in 2011, Robert calling me and saying, oh hey the state’s making a u-turn (?) … and there’s nothing we can do. It was one bill about one thing and now it’s a bill about something else and the comment period is closed. We wouldn’t have enough time to get enough people down to comment. It’s like we don’t know what to do. We’re gonna have to hope that during the rule making we can make this an accountable thing. This was the public lands development corporation, so I’m gonna share a few slides with you about where this began. Mahina: And on the intent of raising money for DLNR. Although they’re cash strapped and they’re definitely in need of that, we don’t believe this is the way. And quite frankly, if you look at the larger projects that they want to do, if you think about it, do you think that money is going to show up magically in their budget for 2013 -2014? No, so, aside from the $100 filing fee for someone who wants to propose a project, we can’t detect any cash flowing into DLNR soon enough, safe enough and adequately enough. To that point, we really would challenge this idea that it will create money for a cash-strapped department. Clearly, it’s just not the way. So, we’re going to talk a little about the PLDC and we still laugh about how the first two words are public land followed by development. Mahina: That’s exactly where it started. Last year, this is actually two yrs ago coming January. But last year, the Senate had a bill that came through. Out of this idea by Senator Malama Solomon and Senator Donovan Delacruz, which all of you probably know by know, is a … [unclear] of this bill. They started on the Senate and it was known as Senate Bill 1555. It was pretty quiet. Everyone agreed. DLNR needed money. Let’s look at something. The original version even included representation by the neighbor islands on the so called “power board” and eventually it got deleted. In a fast switch, 23 days later, it made its way to the House and major revisions including removal of neighbor island representation, and a five member board, four of which have no cultural history experience background. They’re all actually financial, finance people, which is red flag #1 for us. But there was a lot of movement that went through the House and Senate pretty quick and before you know it, it showed up on the finance committee and they along, this is the committee – but Calvin Say who our own… [?] Joseph is trying to unseat. And you can’t waive that, but they did. 115 minutes. We’re not making this up, there are records. We actually went into research and tracked it down to when these things made it through the legislature. So already we know this isn’t good. Most of us are pretty dormant, we just don’t know this is happening because this is 2011 of last year. Eventually… it makes its way through and it lands on Governor Abercrombie’s desk, and as you know, he can sign it into law or let it become law. So in a very rapid manner, it got signed into law. It lies dormant for a while, and now here we are in 2012. Mahina: No public lands. And the interesting part with that is that as they were going around to get public input on what is known as the administrative rules, the rules that will help them govern and move and maneuver their way through their authority and power, they were already in discussions with public lands. In July in fact, Mr. Haraguchi (sp? ), the executive director, had already met with two organizations, two potential developers to talk about prime farm land on Oahu. Prime farm land we use currently now. And in July, he met with a group called the Relativity Video and Access Land Lease, one to create workforce housing and one to create a sound state studio. So they were already in discussions before July. They had no rules and were discussing the project. They did not have full authority but were already in motion. So we started paying attention because it was becoming a little too quick under the radar. So by the time it came to us, the public, we had a lot of questions including the community…. Lucienne: Let me jump in here. Hugh Starr reminded me that the very first incarnation of this bill was only about the Ala Wai Boat Harboar and another small harbor on Oahu, Ke’ehi Lagoon, and it just sort of morphed in to this million acre deal on public lands across the state. And as we all know our public lands are mostly on the neighbor islands. Most of the public lands are you know.. Maui County. Q: How did the public lands become public lands? Lucienne: As it says here (slide), most of the public lands were once owned by monarchy and the Kingdom of Hawaii so there’s really some debate about whether it can be legally transferred to anybody. But this bill is just moving forward to say look, we have these partnership opportunities with people. I had a personal presentation by Senator Delacruz and he was so proud, “Look we have this park here that no one’s doing anything with and we could do wonderful things, like we have a private group that wants to come and build cabins and build a restaurant and build that. And it was interesting because there were a couple of citizens there that said we have a nonprofit group that’s been working with this park for years and DLNR will never give us a lease to do anything. Why all of a sudden from some corporation you’re all interested in doing something but if a local community group that wants to invest funds here, you just kind of pushed us away. It just didn’t make a lot of sense so a lot of what’s at stake here on Maui – we have Makena State Beach, Hawaiian Home Lands, everything in light green or dark green are public lands in South Maui. If you go on to East Maui, thousands of acres of our rainforest and you can see a lot of lands along the coast too. Someone might think, “Wow, that’d be a nice place for a resort.” Upcountry, we have Hawaiian Home Lands. We have our wonderful state forest reserves at Polipoli, we have our Makawao state forest reserves. Once again, a lot of stake, and then in Central Maui a lot of the areas that are our watershed land, and above Haiku and Huelo and these were all crown lands. And it really … the water rights upcountry. What if someone came along, some Chinese firm and offered to pay more than A & B and lease them to extract water. Would we have a say, and of course the answer is no. We need to do something about this bill. I’m handing it back to you. Their chair is the director of finance, Calvin Young, and they also have William (?) over here on the far end…. The deputy director of DBED (Dept of Business and Economic Development)… and two appointees… one a former developer Duane Kurisu…and one an attorney, Bobby Bunda, former legislator… If they’re sitting around a circle, a board meeting and a project comes up to them, someone says how much can this make us. That’s what drives the decision making, and that’s the fear. Their decisions are not, their priority, their interest is not to protect and preserve but to seek out what the inventory of lands are and to be the most revenue generating for that purpose to give the money back into the state. Lucienne: And …they made specific suggestions about the rules. A lot of people said oh we don’t like this, this is just terrible. But there were people who did their homework and said we should change this paragraph. We should make the rules different this way. And mahina was one of them. But did they listen? No. Mahina: But what was interesting is that in the original administrative rules proposed in August. If you read it through, the whole document was peppered with the word “developer, developer, developer” Now I’m going to tell you now, I’m not anti development, but I’m anti stupid. And yet (hard to understand) it states on the far right/line at least one people meeting in the community affected, one, just one. So the process is someone will come to them with a proposal, pay $100, which used to be $500 but somehow it got changed. It’s a $100 fee now. They turn in their financials, do a nice form, make sure that they have the background for it. The board’s executive director, Mr. Haraguchi (sp?) reviews it, to see if it meets the minimum of what they want. It gets recommended to this five member board. The board asks its questions, are you sure you’re solvent, are you sure you can make money, whatever whatever. You’re required to have one public meeting. Q from audience: Has anything gone through yet? Q: …A lot of people had no knowledge.. how would you officially stop rhetoric? Mahina: In my personal opinion, I think …hold? Put? your feet to the fire when you see see it rear its ugly head. Q: is there a standard to hold your feet to the fire? What about due process, which is the recommended rule under every state under federal compliance…? Why don’t we use that? Commenter who asked initial question: Well if they’re not fulfilling their obligation under federal law… this state has the right to turn every official for lack of due process. (?Not sure who replied to this):The state has an exemption. They’re not under the sunshine laws, so they can do anything they want…. 48 hours..
Flutter of wings… birds hopping on the sand… waves breaking… clouds slowly forming and reshaping overhead… sunlight on shadows… wind rustling through the trees. Beach time is sacred time. This time of year, we are scanning the horizon for whale spouts. But there’s plenty of wildlife the rest of the year, like the mongooses that visit the beaches. (Did you know the plural of mongoose is not mongeese?) Also there are many birds who live at the beach: sparrows, mynah birds, and little red cardinals. Occasionally, we’ll see a sandpiper or franklin. Sparrow in mid flight at Makena. DH and I often bring bread or cooked rice to share with the birds at the beach. We don’t bring uncooked rice, since that can expand in their stomachs and kill them. The sparrows sometimes will even eat off our fingers in mid-air. It’s great fun to watch. A bird watching friend said that birds have incredible vision and can actually recognize faces, especially of people who feed them. Must be true, because they always hang out at our beach blanket. This blog post is my photo response to MauiShopGirl's challenge: Black and White. If you love birds and have enjoyed this post, you might also want to check out my flightier post on the White Bird Tree of Wailea. 2. Over time, the birds will get used to you and will stop by your blanket. 3. Put the food closer to you over time. 4. Try holding the food in your hand and hold very still. 5. Eventually some brave bird will eat it, and others will follow. What will beach birds eat? Besides grains, seeds, and breads, Maui beach birds also enjoy apple cores and sometimes fruit. I hope to write more about this a bit later. Let me know if you'd like to see beach birds eating apples on sticks or see any bird videos. Bird day at the beach. Yes, the rice is cooked. Take a good look around the next time you're in a restaurant or store on Maui. Look above the store displays, above the cashier's area, or even above the aisle you're standing in. 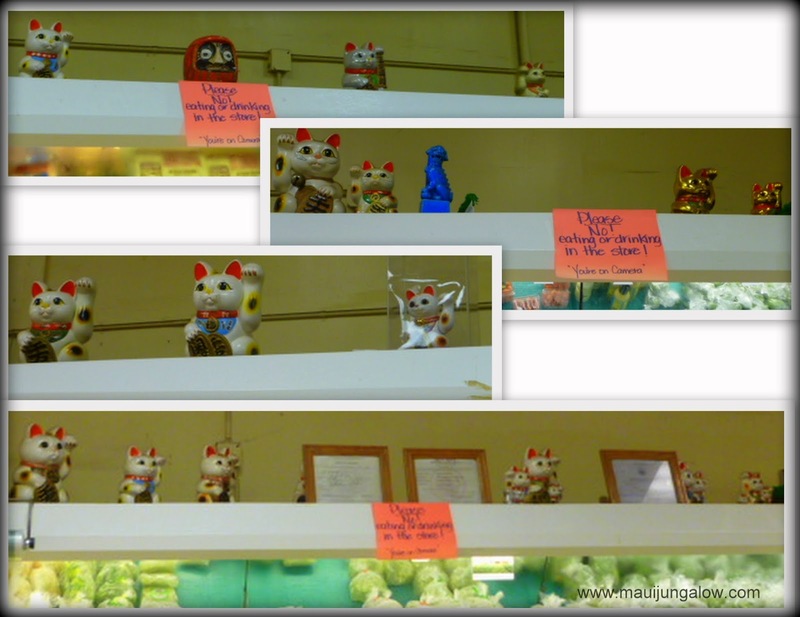 If it's a local store, bank, or small restaurant, there are very often Japanese good luck cats facing the front door. One paw faces up, always faces up, and there is some symbolism with the height of the paw or whether it's a right or left paw. A good luck cat gazing thoughtfully at the front door, at Pukalani Superette. The establishment doesn't even have to be Japanese or owned by a Japanese family. These good luck cats are well respected totems of prosperity and protection. Haiku Grocery takes the cake! There are so many good luck cats and prosperity statues that it requires several pictures. The pictures are a bit fuzzy, but you get the idea. The top left picture with the red totem with BIG eyes is a Japanese daruma doll, another good luck figure. The blue figurine appears to be a dragon, which could be Japanese or Chinese. A Filipino restaurant and take out place in Wailuku. Two good luck cats and what looks like a rabbit, next to the scale. They do face the front door. Chicarron is a fried delicacy - fried pork rinds - like in the deep South! A good luck altar at Sheik's restaurant in Kahului. Sheik's has a local following. DH sometimes goes there for mac salad. Good luck symbols include a bamboo kadomatsu, a daruma doll, good luck cats, and a boat of Japanese folkloric figures - the Seven Lucky Gods. originally based in California, but now owned by CVS. Another common practice is for stores or retail establishments to have a Hawaiian blessing before opening, replete with a Hawaiian kahuna (master teacher) doing a ritual chant. Often a maile leaf lei is draped across the door. 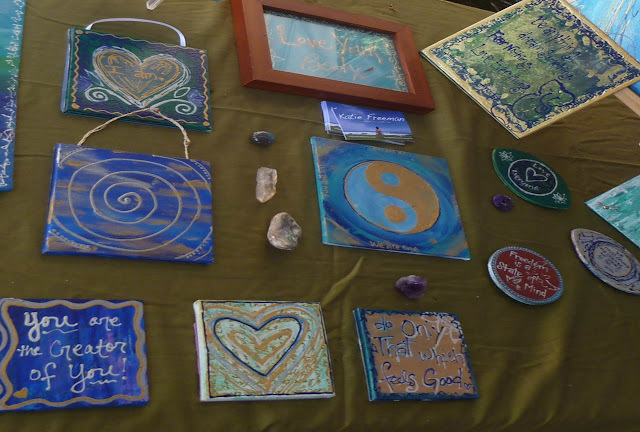 The only picture I have of that is from the Art Maui blessing this year.